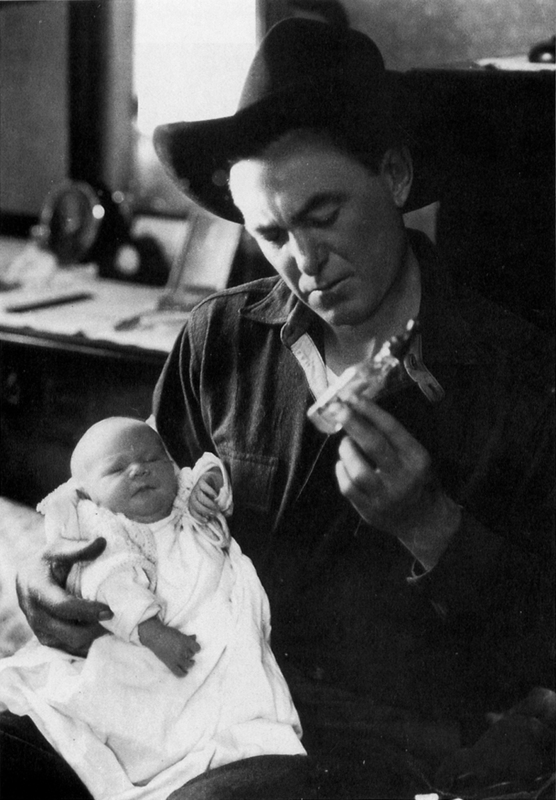 Actor Harry Carey Sr. with newborn baby Harry Carey Jr. (aka Dobe) at the family home in Saugus where Dobe was born in 1921. The original wooden homestead house survived the 1928 St. Francis Dam Disaster but burned down in 1932. It was replaced with an adobe ranch-style home that later became the centerpiece of the Tesoro Adobe Historic Park in the Tesoro Del Valle subdivision. About Harry Carey Sr.: Actor Harry Carey (Sr.) acquired a homestead at the mouth of San Francisquito Canyon in 1916 and established a rancho. The ranch included the Carey's wooden ranch home as well as several outbuildings and the Harry Carey Trading Post, which was a tourist attraction that included billed entertainment from Navajo Indians and other performers, along with a store that sold Western and Indian curios. The ranch was occasionally used for filming. The Careys' son, Harry Carey Jr. (Dobe), who would follow in his father's acting footsteps, was born in the Carey ranch home in 1921. DC2101: 9600 dpi jpeg from original print courtesy of Harry Carey Jr.